For the first 12 days of December, you can get either of Kyle Dine's CDs + a glow in the dark guitar pick for $12 - including shipping and handling! 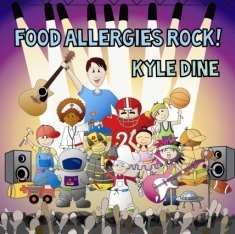 Dine's "Food Allergies Rock!" is an upbeat and engaging album packed with songs to clap your hands, stomp your feet, and sing along to! The music will empower and support children with food allergies, and educate all listeners about the condition in a fun way. Music about food allergies? You Must Be Nuts! 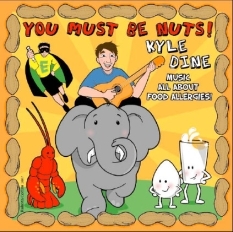 Kids are loving Kyle Dine's CD packed with sing along songs that the whole family will enjoy. Favorites include "EpiMan", "Smellephant the Allergic Elephant", and "Stop! Please Don't Feed Me!"